If you abhor something, you dislike it very much, usually because you think it’s immoral. When you accede to a demand or proposal you agree to it, especially after first disagreeing with it. If you acquiesce to something, you allow something to happen or you do something that someone wants without putting up a struggle or voicing your own concerns. Adulation is praise and admiration for someone that includes more than he or she deserves, usually for the purposes of flattery. When you advocate a plan or action, you publicly push for implementing it. If something or someone is anathema to you, such as a cursed person or object, you very strongly dislike it or even hate it. An aspersion is an unkind remark or unfair judgment attacking someone’s character or reputation. If you besmirch someone, you spoil his good reputation by saying bad things about him, usually things that you know are not true. Calumny is an untrue or unfair statement made about someone in order to hurt his or her reputation. Mass carnage is the massacre or slaughter of many people at one time, usually in battle or from an unusually intense natural disaster. To coddle someone is to offer too much protection from harm or difficult experiences. To corroborate something that has been said or reported means to give information or evidence that further supports it. If someone is cosseted, it means that he is given a lot of care and attention to protect him from anything unpleasant. If someone will countenance something, it means she will approve, tolerate, or support it. To defile something that people think is holy or important is to do something to it or say something about it which is highly offensive. If you denigrate something, you criticize or speak ill of it in a way that shows you think it has little to no value at all. If you deprecate something, you disapprove of it strongly. If you disparage someone or something you say unpleasant words that show you have no respect for that person or thing. An egregious mistake, failure, or problem is an extremely bad and very noticeable one. An encomium strongly praises someone or something, via written words or verbally. A eulogy is a speech or a piece of writing, often part of a funeral, in which you praise someone or something very much. When you execrate someone you curse him to show your intense dislike or hatred of him. To fawn over someone is to be extremely nice to her in an insincere way because you want her to like you or give you something. When you pay homage to another person you show great admiration, respect, or even worship towards her. Something innocuous is not likely to offend or harm anyone. When someone is lionized she is treated as being very important or famous although she might not really deserve to be. If you malign someone you say unpleasant things about him to damage his reputation. If something is noisome it is extremely unpleasant, especially because it is very dirty or has a bad smell. A panegyric is a speech or article that praises someone or something a lot. When you are reverent you show a great deal of respect, admiration, or even awe for someone or something. If something is reviled, it is intensely hated and criticized. A salubrious place or area is pleasant, clean, healthy, and comfortable to live in. A salutary experience can be unpleasant or difficult but is useful for or of benefit to you because it strengthens your character. If you vilify people, you write or say bad things about them to make them unpopular. As a schoolteacher and school dean, Bruce abominated the unjust actions of bullies. Their cruelty and manipulation of those weaker than themselves were an abomination in a place of learning, where students should feel safe and comfortable. Bruce abominated the way in which the bullies ganged up on selected victims and behaved in extremely mean and abominable ways. Quiz: Try again! 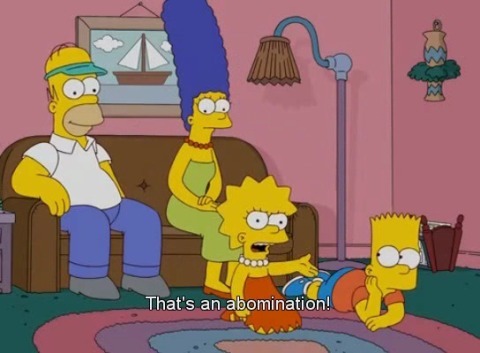 What does it mean to abominate something? To disagree with it on moral grounds. To work to change an injustice. To loathe and despise it. Bomb it! Willie's work was so a"bomb"inable that his boss fired him within a week after being hired. The idea here is of an unfavorable omen or bad sign about the future; when the omen is away or prophetic sign is from what one wishes, one strongly dislikes what it predicts, thus one abominates it. The Simpsons Lisa is appalled by this abomination.